Since the seminal paper on phase transitions in bimanual rhythmic movements, research from the dynamical systems perspective has given primacy to rhythmic coordination. While rhythmic movements are a ubiquitous and fundamental expression in biological behavior, non-rhythmic or discrete movements are of similar importance. In fact, rhythmic and discrete movements are commonly intertwined in complex actions. This review traces our strategy of extending a dynamic systems account from rhythmic to non-rhythmic behavior. 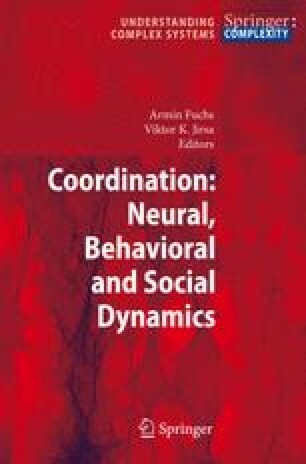 Behavioral and modeling work on uni- and bimanual, single- and multijoint coordination increasingly investigated more complex movement tasks consisting of rhythmic and discrete elements. The modeling work suggested a three-tiered architecture consisting of a biomechanical, internal and parameter level with different responsibilities for different components of movement generation. A core question raised in the modeling is what are the fundamental units and principles that are tuned to make up complex behavior. Are rhythmic pattern generators the primitives for generating both rhythmic and non-rhythmic behaviors? Alternatively, are discrete pattern generators fundamental, or are there two primitives of action? fMRI experiments compared brain activation in continuously rhythmic and discrete movements. Significantly more activation in discrete movements suggested that discrete movements have higher control demands and may be distinct primitives, different from rhythmic movements. This result corresponds to the modeling work that highlighted that discrete movements require more parameterization.